Singapore (Malay: Singa (lion) + pura (city)) is a city-state and parliamentary republic situated on a group of islands at the southern tip of the Malay peninsula. Its land area is 712 square kilometers. Singapore declared independence from Britain on 31 August 1963 and became a sovereign, independent nation on August 9, 1965. Urban population: 100% of total population. Population aged 15 years & over who are literate: 95.9%. Total SMS messages: 27,714 Million. 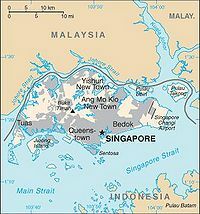 Singapore was an ignored, swampy island with only a few fishing villages until 1819 when Sir Stamford Raffles of the British East India Company was given permission to establish a trading station by the Sultan of Johor. Raffles had spotted its strategic location as a crossroads on the shipping routes to the East and set about turning the island into a free trading station. Alongside the British colonial presence it attracted many entrepreneurs from China, India and the Middle East and within 5 years the population rose from 150 to 10,000. In 1824 the British bought the island outright from the Sultan. Following the Anglo-Dutch treaty of 1824, the Dutch, who had largely been the dominant colonial power in south-east Asia, withdrew any objections to the British occupation. The British tended to congregate round the river waterfront and many grand buildings in the Palladian style were built largely with the help of Irish architect George Coleman. With the opening of the Suez Canal in 1869, the invention of steamships and the laying of long-distance telegraph cables Singapore became increasingly important as a port and trading center. At the outbreak of World War II, Singapore was regarded as a well-defended base for the Allies in the Far-East. However, on February 15, 1942 Singapore fell to the Japanese after six-days of fighting. The occupation of the next three and a half years was brutal with many atrocities and war-crimes being committed. The island was renamed Syonan (Light of the South) until the defeat of Japan. The occupying forces formally surrendered to the British at the Changi prison-camp in September 1945. Lee Kuan Yew, Ex-Prime Minister of Singapore, in office: 5 June 1959 – 28 November 1990. With only a small land mass and limited natural resources Singapore was forced to industrialize and develop its technical prowess alongside its trading and transportation hub role. Government policies emphasized the role of education, especially in computer science, and, increasingly, bio-sciences. ↑ Singapore as Part of Malaysia. This page was last modified on 13 June 2018, at 17:51.